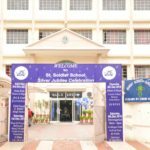 To bring forth the innate skills and have the creative genius of the students,St. 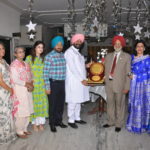 Soldier Mohali organized ‘Kala Kriti’ –an Art and Craft Exhibition on 3rd Nov, 2018. 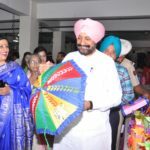 The Chief Guest Mr.Balbir Singh Sidhu-Cabinet Minister, Animal Husbandry, Dairy Farming, Fishery and Labour, Punjab graced the occasion. His benign presence enthused the students. 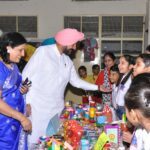 All the artifacts on display were the handiwork of the students which were made from the indigenous products as jute, cloth, beads etc. 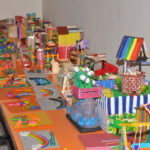 The students from Classes Play Group-Classes IX & XI showcased their asesthetic abilities and there were corners in the exhibition attributed to art, jewelry, glass painting, fabric painting and best out of waste. The live demo corners catering to nail art, tattoo and mehandi was a hit among the audience. 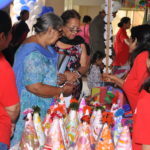 The creativity of Play-Group, Nurseries and K.Gs captivated the attention of Parents especially the Name Plates,Bookmarks and Photo Frames made with the Ice-Cream sticks.Hand bags, Foot mats andCushion covers made out of old jeans, waste towels , wool and old T-shirts were the outstanding pieces of skill and art. With Diwali-the festival of lights around the corner Diya decoration, decorative candles,small and cute candle holders sold like hot cakes. The Mock Company of the school ’Tasty Treat’ satiated the thirst of the audience with their ‘Kool Korner’ by selling out cold drinks and ice-creams. 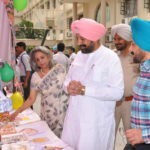 To tickle the taste buds of the people ,the senior students along with their teachers put up Funky Food Stalls which included- Chinese snacks like Veg.Manchurian, Noodles and Spring Rolls. The spicy Chaat Papri, Golgappas, Grilled Sandwiches, Stuffed Kulcha etc. were among the delectable mouth watering eatables. 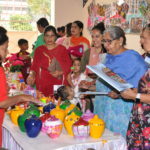 The exhibition saw an overwhelming response by the audience as there was not only a heavy footfall but also people purchased the handcrafted items. 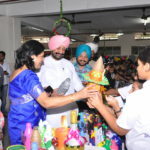 Classes K.G., IV and XI were adjudged the best for their excellent creativity and neat display by the judges Ms. Preetinder Khurana and Ms. Neelu Sandhu. 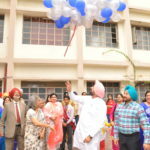 The Chief guest applauded the teamwork and aesthetic abilities of the students and teachers .He also appreciated the effort of the school to provide a platform to the students wherein they can exhibit their hidden talent. 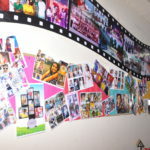 The exhibition was conceptulised by Ms. Anjli Sharma and proved to be a huge success which was lauded by one and all.